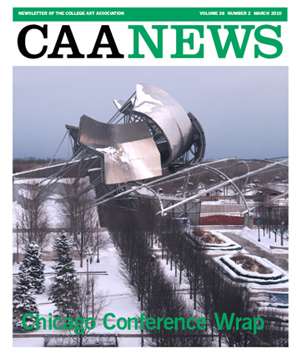 The March CAA News—which presents a wrap-up of the wildly successful 2010 Annual Conference in Chicago—has just been published. You may download a PDF of it immediately. This issue offers conference summaries from multiple perspectives by key players, including CAA’s conference director Emmanuel Lemakis, Services to Artists Committee members Brian Bishop and Sabina Ott, and more. Dawoud Bey’s keynote address at Convocation is reprinted in full, and a report from the Board of Directors meeting is also included. And don’t miss the wide selection of full-color photographs from the many conference events. If you missed the web article on the Coalition on the Academic Workforce’s statement on part-time faculty, or the calls for editorial-board members of CAA’s journals, you can catch up with the March newsletter. The CAA News editor is still accepting submissions for the Endnotes section for the May issue. Please send your listings for recent solo exhibitions, books published, and exhibitions curated, as well as news about your new position or your grant or fellowship, to Christopher Howard. Interested in advertising in CAA News? Please contact Bradford Nordeen at 212-691-1051, ext. 252.